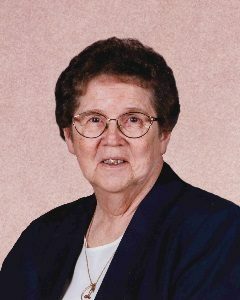 Marjorie “Lorraine” Olson, age 92, of Hutchinson, passed away Saturday, December 1, 2018, at her home at Woodstone Senior Living in Hutchinson, Minnesota. Funeral Service will be Friday, December 7th, 2018, at 11:00 A.M. at Riverside Church in Hutchinson with interment in the Oakland Cemetery in Hutchinson. Visitation will be Friday, December 7th from 9:30 A.M. to 11:00 A.M. at Riverside Church in Hutchinson. Marjorie Lorraine (Bailey) Olson was born on January 15, 1926, in Minneapolis, Minnesota. She was the daughter of Philip and Ruth (Carlson) Bailey. Lorraine was dedicated as an infant. She received her education in Sauk Centre, Minnesota, and was a graduate of the Sauk Centre High School Class of 1944. Lorraine furthered her education by attending North Central Bible College in Minneapolis, for 3 years, graduating in 1947. On August 7, 1948, Lorraine was united in marriage to Merle Olson at the Assembly of God Church in Sauk Centre, Minnesota. Early in their marriage, Lorraine and Merle resided in Minneapolis. They then spent time living in Sauk Centre and Starbuck. Lorraine and Merle later made their home in Hutchinson. Their marriage was blessed with five children, Sandra, Sharilynn, Judith, Philip and Rochelle. They were also blessed with a foster son, David Maag. Lorraine and Merle shared 70 years of marriage. Lorraine enjoyed sewing and quilting. Her children and many of her grandchildren enjoy and treasure the quilts she made. Lorraine and Merle had many foster children and received a special honor as foster parents. Their many travels included trips throughout the United States, Norway, Bangladesh, Estonia and India, where she met Mother Theresa. Lorraine loved to play games and had the reputation of being a real competitor – ask the grandkids! She also enjoyed reading and had an extensive library. Merle and Lorraine were famous for giving joke gifts and were known to laugh until they cried while wrapping and watching the recipient open the gift. Most of all, Lorraine treasured her family and loved the Lord. She generously gave to support God’s work throughout her life. Lorraine passed away on Saturday, December 1, 2018, at her home at Woodstone Senior Living in Hutchinson at the age of 92 years. Lorraine is preceded in death by her Parents, Philip and Ruth Bailey; Daughter, Sandra Mattson and her husband, Richard; Foster Son, David Maag; Siblings, Roger Bailey, Shirley Hoglund and her husband, John.